Meitnerium is a highly radioactive transactinide element not found in nature. The element was first synthesized in 1982 by a German research team at the GSI Helmholtz Centre for Heavy Ion Research, who accomplished this by bombarding a bismuth-209 target with accelerated iron-58 nuclei. The most stable known isotope has a half life of only 7.6 seconds, making it too short-lived for practical application or in-depth chemical study. It is expected to share properties with the platinum group metals based on its place in the periodic table. Meitnerium was named in honor of Austrian physicist Lise Meitner, co-discoverer of nuclear fission, the element protactinium, and the Auger effect. Meitner’s contributions to science were routinely overlooked during her life (1878-1968), a fact which likely contributed to the IUPAC's recommendation of this naming in 1994, as well as the official adoption of the name in 1997. Meitnerium is a D-Block, Group 9, Period 7 element. The number of electrons in each of Meitnerium's shells is 2, 8, 18, 32, 32, 15, 2 and its electron configuration is [Rn]7s25f146d7. In its elemental form, Meitnerium's CAS number is 54038-01-6. Meitnerium was first created in 1982 by a team headed by Peter Armbruster and Gottfried Münzenber at the Institute for Heavy Ion Research (Gesellschaft für Schwerionenforschung (GSI)) in Darmstadt, Germany. Meitnerium is a synthetic element that is not present in the environment. Little is known about the element, its appearance is unknown, and it has no known uses. Meitnerium is named in honor of the Austrian physicist Lise Meitner, one of the discoverers of nuclear fission. Meitnerium information, including technical data, properties, and other useful facts are discussed below. Scientific facts such as the atomic structure, ionization energy, abundance on Earth, conductivity and thermal properties are included. 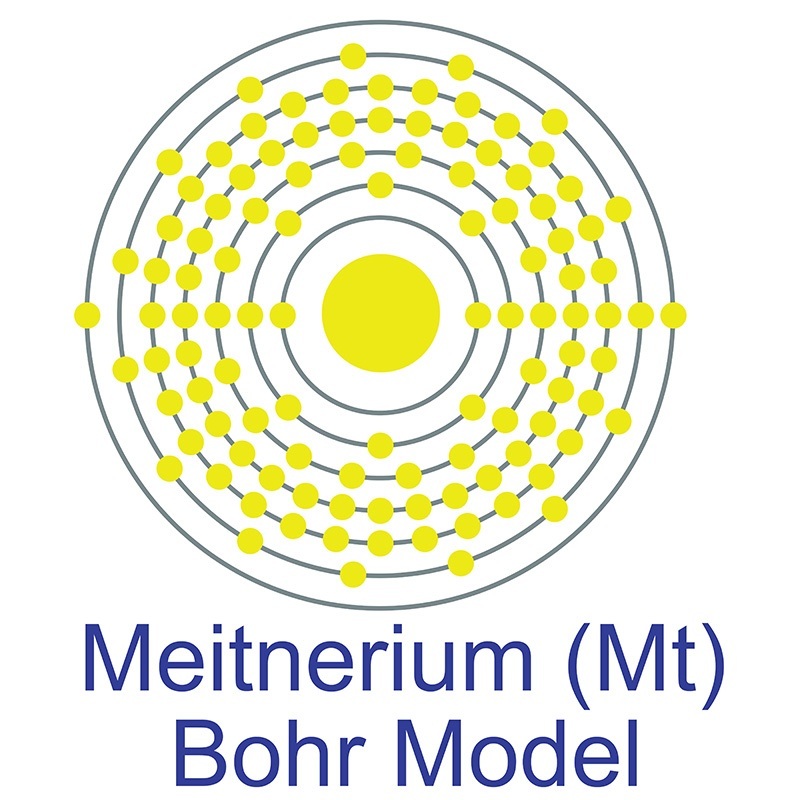 Meitnerium (Mt) is an artificial element. Like all artificial elements, it has no stable isotopes.